The story of Drunvalo Melchizedek is a pitiful case in which the spirits of error took advantage of his ego and his ignorance to suggest him the most twisted explanations of facts that essentially are very simple. In spite of his nonsensical theories, Drunvalo Melchizedek has many followers that do not use their common sense to realize that his teachings are in fact figments of his imagination. Dear professor: I’d like to know the opinion of Group Elron related to Drunvalo Melchizedek. This enigmatic person has published some extremely strange theories on diverse topics that I consider they need clarification from the Masters of Light. Dear Yoel: In fact it is not necessary to waste time asking the Masters of Light on the incredible theories of Drunvalo Melchizedek because they are evidently delusional, on one hand, he has his mental decoder damaged, on the other hand, the spirits of error are always creating confusion, obviously he gives them place due to his ignorance, his naivety and why not to say it? - His wickedness. I remind you, first of all, that any teaching is very dangerous when it has truths mixed with falsehoods because if one is based on truths, swallows garbage without realizing it. The following comparison will shed Light on the preposterous ideas he has written so far. If you have read Drunvalo’s teaching from Merlin, you will possibly realize how outlandish his ideas are. The truth we know about the Crop Circles is even simpler, The signs made on the crop fields are made by extraterrestrials and these signs have particular coded messages that reveal information about our planet, our evolution and our present behavior. History has talked about the Mer-Ka-Ba mostly as the vehicle that allows a person to ascend or descend into the higher or lower worlds. But actually the Mer-Ka-Ba is much more than just a vehicle of ascension. It can be, really, anything — since it is the primal pattern that created all things and all universes, both visible and invisible (see The Ancient Secret of the Flower of Life, volumes I & II). In the Bible there is reference to Ezekiel and the wheels by which Ezekiel ascended into heaven. This was the Mer-ka-Ba.In the Torah, there is reference to the Merkavah (as it is spelled in Hebrew) which has two different meanings: One meaning is ''chariot,'' which is a vehicle; the other is the ''Throne of God.'' When the two definitions are combined, the true meaning comes to life. History tells us that "impossible things" actually occur with great frequency. Ancient and even recent historical writings are full of the stories of people who have in fact done the equivalent of putting the egg back together again -- stories of men and women who have performed the seemingly impossible. Miracles, if even a tiny fraction of the reports are true, have happened continuously through history and are still happening today. But although most people do believe in ancient miracles, many of us think that they are not happening any more. We believe that the Age of Miracles is over. And yet, if what we are learning is true -- if science is turning out to be impotent to actually reverse the destruction of our environment -- then if we are going to heal our world, we are going to have to do it with "metascience." We are going to have to create miracles. And this will only be possible if we are willing to make the changes within ourselves where we can accept miracles as possible in our everyday world. We all have read the miracles found in the Bible, the Koran, the Bhagavad Gita, the Zen traditions, and many other sacred sources. But we do not believe that this level of consciousness is happening now. Especially, we think that our own abilities are not capable of creating miracles. Of course, our official media have not helped us, for they have focused on the human dramas of tragedy, pain and death. When Mother Mary appears and heals a child, as she has done so many times just during the last decade, this event does not reach the evening news -- not even if the event was photographed and witnessed by hundreds of people. * In India, Sai Baba regularly creates "vibhuti ash" out of his hands -- literally, out of nothing. This has been photographed many times. Thousands of people have watched him do this, and much more. * Parmahansa Yogananda tells the story of a sadhu, a holy man, whose "right arm was severed almost completely from his body" by a policeman. The sadhu said, "'The Beloved Mother is taking care of me.'" And "he pushed his dangling arm into its stump and lo! It adhered; the blood inexplicably ceased to flow." The sadhu then told the policeman, "'Come to me under yonder tree in three days and you will find me fully healed. Thus you will feel no remorse.'" In three days the policeman and a witness went to the spot. "The Sadhu was there and allowed us to examine his arm." Yogananda writes. "It bore no scar nor trace of hurt" (Autobiography of a Yogi, Self-Realization Fellowship, 1979, p. 38-39). Who could believe such nonsense? Who could believe that an almost completely severed arm can be attached miraculously to a body again? Such thing would be against the natural law that the Absolute created, and we know the not even the Absolute is capable to trespass the laws that he enacted. As for Sai Baba, we know that his thetan is in a plane of error (spirit of error) and his alleged miracles are merely magic tricks and in rare occasions he receives the help of spirits of error. In addition, Sai Baba uses these tricks to bamboozle his followers. Notice that the Masters of Light do not use these tricks to give their teachings; they respect our Free Will and do not force anybody to accept them. It is clear to people studying these children that they also have very heightened psychic abilities. They can literally read their parents' minds. They know what you are thinking. These and other differences you can read about in The Indigo Children have led researchers to realize that a new way of raising these children is mandatory. If you have had a child or are raising a child born after 1984, you need to read this book. Who the Indigo children are, of course, is in great debate. Many psychics are saying that they are coming from the indigo ray, a very high level of consciousness not of this Earth. I also feel this is true, for when I first met the angels in 1971 they began talking about these new children that would come in the future and change the world. They told me many details about them that are coming true at this time. Also, many psychics I have discussed this subject with feel that there are actually two different cosmic sources for these children. One is the indigo ray and the other is the deep-blue ray, similar but different. Wherever they come from, it definitely is a diversion from the normal human evolutionary track. According to the Masters of Light, Indigo Children as well as Crystal Children do not exist, they are merely outstanding children that have well-developed mental decoders. In addition, nobody can read minds because telepathy in the physical plane does not exist. Edgar Cayce, the Sleeping Prophet, predicted long ago, while Russia was still under Communist control, that she would wake up from her deep sleep and emerge to become the spiritual "Light of the World." I believe that in this very moment, that prophecy is becoming a reality. 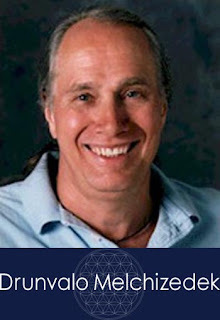 Drunvalo Melchizedek naively believes in prophecies and predictions, however, according to the Masters of Light, the prophecies of Edgar Cayce and the prophecies of any other fortune-teller are merely a deception of the spirits of error that dictate nonsensical ideas to the mind of the medium. For example, the prophecies of Cayce related to Atlantis never came true and they never will. If nothing else strikes us about Sacred Sites — these wonders of the Ancient World — it is the fact that they were built to last into our time! Why? Could it perhaps be that they hold a message for us, like a secret letter that we may only now open, and begin to read? In reference to the Pyramids of Egypt or any other alleged energy around those places, there is a logical explanation from the scientific point of view and it has nothing to do with secret messages or mystical places. In fact the pyramids of Egypt were teleporting machines that were used by extraterrestrials from Orion 3 and the megaliths of Stonehenge were only signs that were erected by an alien race with the purpose to mark the route they had to the other aliens. It is truly incredible that someone who says so many absurdities has so many fervent followers. It would constitute a deplorable waste of time to keep on analyzing the delusional theories of Drunvalo Melchizedek, which in fact have had a big dose of help from the spirits of error. This entry was posted at Wednesday, April 21, 2010 and is filed under Who are they? . You can follow any responses to this entry through the .